Discussion in 'Lighting and Electrics' started by SteveB, Apr 4, 2009. For those of you (us) who are interested in how it was done in ye olden days.. Note that in every case, the available documents have a (1) or whatever after the document name, indicating number(s) of documents in that series - such as (2) pages of Magic Sheet, as example. If no number is shown the document is not as yet posted. I perused this stuff last night and was very, very late getting to bed, as it is entirely captivating to see (and recall - as my career started in '74) how the process occurred, long before moving lights, computer consoles, and computer generated paperwork. I've seen light plots from some of the 60's generation before, having seen a design that was drawn by Don Holder when he was an assistant. Here's Hair as drawn by Jules Fisher when he was 31. Wow, I am kinda suprised by these plots. Jules used a par for every symbol and didn't include color OR channel notations on his units. That's what paperwork is for. I did ACL a few years back in college. We had an original cast member of the first national direct the show. She wanted exactly the original design in all aspects, so we adapted Tharon's plot. Was rather interesting to actually do. I lost my copy of the original plot, glad to see its now online for everyone to see. Hand done instrument schedules and channel hookups are pretty cool to see. rather interesting to actually do." Be very careful about posting this, as it's essentially admitting to plagiarism. One of the things the USA829 sticker assures the original designer, is that the work is copyrighted and that the union will make sure that anyone copying the design will be paying royalties to the original designer. I believe this was enforced in court in Chicago a few years back with Urinetown. Just a heads up to maybe not post this on the web. I'm certain that many designers, including all those on the advisory committee, are concerned over exactly this type of issue, as along with the plot, comes much of the paperwork that would let you do exactly what (shall remain nameless) attempted, re-creating the original, without any input from the original designer. In my mind, that is un-ethical. The site has a comment about how the selections are intended for non-commercial use only, but I would assume they are not intending the use for anything other then observation of a key event in the history of stage lighting in the USA. And before anyone gets going on the issue of how un-ethical can it be for a piece done 40 years ago, remember that Hair just opened on Broadway and that Tom Skeltons work for ABT is part of their Rep and still recreated. Having this data available creates somewhat of a risk for a new and younger LD to be handed a pile of paperwork and be told "Here's all the original work, bring it up to date and re-create it". If it were the original Hair paperwork right off the web, I'd be betting Jules would be less then pleased..
Wow, thanks for finding this! It is such a great resource, and a nice glimpse into the past to see how things were done before Vectorworks and Lightwright and moving lights and scrollers. Just two questions about the Chorus Line paperwork for anyone who might know: What brand of gel is she referencing? I tried the obvious ones like Roscolux, Lee, Gam, and Roscolene (and Apollo just for fun ), but no luck. Does anyone know? Also, after briefly comparing the plot with the focus charts, I notice that she doesn't change beam spreads as a focus point gets closer. For example, all of the instruments in the torms are 6x12s, regardless of whether they're focused to the near side or the far side of the stage. Same with the box booms. Does anyone have any idea why she didn't change beam spread as the throw changed to get a consistent beam size and intensity? All of the 800 numbers are Roscolene. I'm not sure what the 649 was, but it later changed to R62. As far as all fixtures in a given location having the same focal length, this is just how it was done back then. The differences in throw distance between a near and far shot were not great enough to warrant (or allow) going wider or narrower, thus the 6x12 (26°) was the workhourse. As to Mr. Fisher using a PAR symbol to represent a Leko, it's something he's always done. The shape of the symbol realy doesn't matter, and it's merely for expediancy. Possibly his last hand-drawn plot, Bring in da Noise, Bring in da Funk, followed this convention in 1996. There were no USITT Graphic Symbol Standards, and The handbook of Stage Lighting Graphics, William Warfel, Drama Book Specialists, 1974, wasn't published or followed yet. Hand-generated plots and paperwork convey so much more of the personality of the designer than CAD ever can. [user]SteveB[/user]--I agree with you that it is plagiarism, and one reason it's so diificult to find production paperwork. On the other hand, we all know two different designers can take the same rig and more it look totally different depending on how it's focused and cued. For more information on the 1975 original, see One Singular Sensation: The Design Team of the Original A Chorus Line. For information on the 2006 production, see A Chorus Line on Broadway. Our own Steve Terry is on the advisory committee. Perhaps Steve can round up more designer interviews to post on the database. In other news, plagiarism is a real thing. I know a girl from a High School north of me who was LD for a production of *blank*. Her Director said "I want Broadway!"... so she went to Broadway, to watch and take notes on the show... twice. She noted in her formal portfolio presentation that it was a shame that she only got to see it twice on Broadway. I would have interpreted her Director's note to be "go big, go Broadway", as opposed to "go plagiarize", but to each their own. Additionally, regardless of that little tagline that says: "paperwork cannot be reproduced or distributed without consent of designer," there seems to be an awful lot of paperwork being traded on the internet. Sure I'll stick them in a folder for safe keeping mrgreen , but once I made the connection that the plot was a technical document, I had to kick myself, then adjust the way I look at my process. Right now, my thinking and concepts happen prior to technical documentation, or instrument inventories, instead arrows. When I draft it all out: "does it work? is there enough X? etc.". Interested to see how this process changes for me over the next four years. "As to Mr. Fisher using a PAR symbol to represent a Leko, it's something he's always done. The shape of the symbol realy doesn't matter, and it's merely for expediancy"
I have in front of me, the March 1981 issue of Theatre Crafts, with an article about Amadeus on Broadway. The original LD was John Bury. The Associate LD was Bev Emmons. The draftsman was Peter Kaczorowski. Most of the ellipsoidals are drawn with PAR64 symbols. The PAR64 symbols are generic triangles. Go figure. When I get a free hour, I'll scan and post (as it's already been published, it's now public domain). It'll take me an hour to figure out how to scan to a useful image resolution and to post. I assume this was common practice, but as to why ?.... The common drawing templates at the time had ellipsoidal symbols, and there are a few 8" ellipsoidal symbols on the drawing, so I have to assume this was a practice common and unique to Broadway. I do know that I was drawing plots in college at SUNY Purchase in '79, and Billy Mintzer, who was a Broadway LD had us using an ellipsoidal symbol for ellipsoidals, with the Warfeld/USITT standard for all types 4.5 thru 6x22. Another curiousity of the time. I wish I would have had the chance to learn from Billy. I hear so many stories about his classes. Dave Finley always had a gem or two for us. Unfortunately that was way before my time (I didnt get there until '01). Although I did learn to draft my ***** off. My favorite part of Jules' plot is that all booms and vertical positions are graphically angled toward 0-0. Ive always been a fan of that in my plots. My thoughts exactly, if I turned in a plot missing information or using the wrong symbols for my hand drafting project I would be hung on a tree all while being regaled by the great drafters of the olden days. I get the feeling the past is held on a much higher level than it really was. Then again I don't worship the importance of paper work like some people. As long as it effectively conveys the needed information, it is good in my book. Sorry to digress, but publication does not place a work into public domain. Public domain essentially means that a work has no copyright attached, usually because the copyright has expired or has not been renewed. --No disk drive, the only way to load program or cues was via paper tape from an ASR-33 teletype. It took like two hours. The program and cues occupied 8K (not meg, not gig, K) of 12-bit non-volatile core memory. --Used early analog multiplexer chips on the output (remember, it put out 2-7.6v wire-per-dimmer analog control) that were very subject to static failures. A few months into the run, the unit was replaced with an updated version that had a single 8" floppy drive. That unit is now in the permanent collection of the Computer History Museum in Mountainview, CA. You can search on "LS-8" and find it online, but the description returned is only that of a DEC PDP-8, not the actual EDI lighting controller. The unit is not on view, but it is in their storage warehouse. I think 649 was Roscolar, a discontinued series. Is it OK if I re-post your recollections/comments on the Stagecraft mailing list ?. There's been an on-going thread about the NYPL collection, centered around ACL and I know the folks would love to read more tidbits. EDIT: I'm simply going to post a link to here on CB. 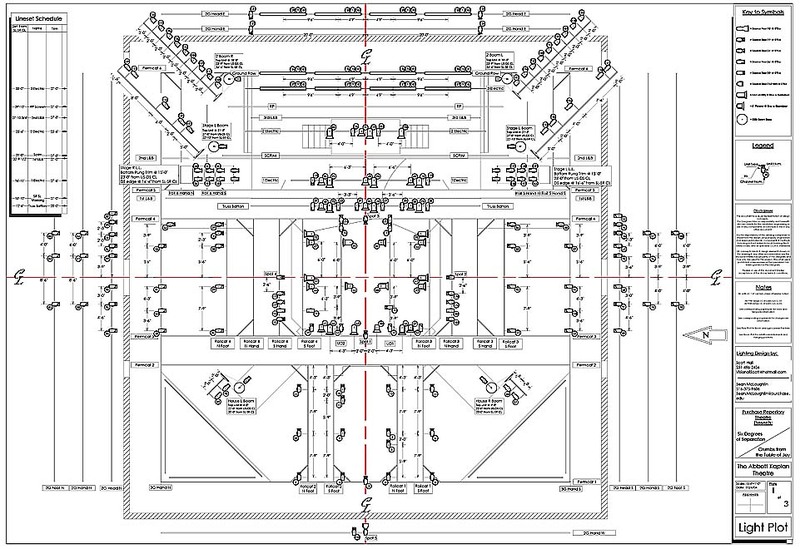 I have drafted the Chorus Line plot in VectorWorks, primarily to get a clearer understanding of the design without having to refer to lots of different paperwork. This plot includes channel numbers and color (approximate matches in Roscolux) for each unit, as well the unit number and (in some cases) the purpose. It's not the best drafting in the world as I just made it for personal use, but it works. No infringement of any kind intended, I simply coped everything she did and made it easier to read. Only comments are, there's no key to instruments, and you've drawn it all as Source 4's, which of course, didn't exist at the time. Indeed, one comment Tharon had made as to why she retired, was that she had a difficult enough time trying to visualize the "new" gels" (Roscolux and Lee) as well as the new quartz halogen lamps in Altman 360Q's. The transition to Source 4's was that much added difficulty for her in choosing colors, after decades of training her mind in what a Roscolene 813 looked like in a ellipsoidal with a T12 500 w lamp, as example. I have drafted the Chorus Line plot in VectorWorks, primarily to get a clearer understanding of the design without having to refer to lots of different paperwork. I just wonder how much insight people get out of looking at old light plots. A plot rarely gives you enough information about the design aside from what fixtures were chosen and where they hang. Also, it is very often that lighting positions are drawn out of place to fit all the symbols and notes so unless you really know the space you may not know what you are looking at. Given that there are many standards for fixture orientation, you can't always guess what a fixture is for. Sure, you can assume that units on the ends of a batten are probably side light, but that isn't always true. A plot is really only an instruction sheet for the electricians. Sure, it affects what angle lights come into each area at, but more often then not LDs don't put information like that on the plot. It could be just my opinion, but I think that really you can't get near as much insight into design from just a plot and paperwork as from a realized design. Even the LD often has to get used to what the design actually is after it is focused. Is it cool to see these old plots? Yes. It is a great way to gain some drafting experience by redrafting them? Very much so. Tell me though, if you didn't see a production of the show with this plot, how much insight ino the design to you actually glean? That's actually why I like this NYPL resource so much. True, just the light plot alone would be interesting, but you couldn't really gain any info from it, since only the unit number is included. However, when combined with all of the other paperwork, it can produce a fairly accurate idea of what each instrument does. I went through and compared all of the paperwork, and I was able to determine the color (which was then converted to Roscolux), channel, dimmer, and focus of each instrument. I assembled all this info on one document just because I think it's much easier to just look at one document for information rather than going to at least 3 documents to determine color, channel, and focus. I can now easily compare her color choices in the sidelight, for example, or admire the complexity of her Mondrian Pattern of light. I haven't done this, but since all the track sheets for each cue are also included, I suppose someone could go through and note which units were on in each cue, determining her use of key and fill, how she mixed colors, and so on. I personally found it interesting to see some of the color and instrument choices that Tharon made, and to see how things were generally done prior to the introduction of moving lights, scrollers, and lots of dimmers. And if nothing else, as you said, it really was a good experience to draft it .